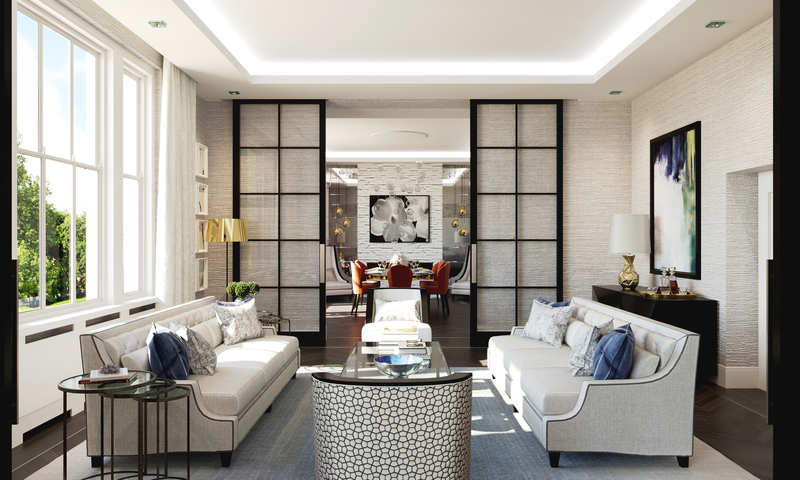 Using our spatial and technical planning skills we have taken this 3 bedroom London apartment and transformed it into a stunning 4 bedroom, 5 bathroom luxury home; complete with maid’s quarters and open-plan living. We worked with the original architect to redesign this apartment to ensure it fitted the needs of the client better. We repositioned walkways, altered door openings, relocated bathrooms and even created an additional bedroom. We not only understand the way clients want to use space, but also how the space should be used in order to create the best functional layouts for the home – making every room flow coherently into one another. High-end finishes and top quality fixtures and fittings were key to the client’s brief, along with functional and flexible living spaces for all the family and entertaining guests. Each room flows into the next – we have created the perfect balance of space and usability within the home.